Classical Education begins with a particular understanding of what an education is. Education, in the Classical sense, is the proper formation of the human soul and mind (intellect) through coming to know what is true and good in order that the student might do good and live according to the truth. The goal of education is the cultivation of mind and soul in order to reap the fruit of virtue. Classical schooling cooperates with church and family by giving particular attention to the right ordering of the student’s mind and soul, cultivated for the growth of virtue. The ancient Greeks and Roman civilizations were periods of growth and advancement. Over 2500 years ago, these cultures developed an education system that continued up until the 20th century. Known as the Liberal Arts, they were the essential tools a free person (from the Latin liberalis: “worthy of a free person”) must know to become a functioning member of society. The Liberal Arts represent seven different fields. The first three of the Liberal Arts are called the Trivium. They are Grammar, Logic/Dialectic, and Rhetoric. The final four are called the Quadrivium. The Quadrivium consists of Arithmetic, Geometry, Astronomy, and Music. The Trivium (Grammar, Logic, and Rhetoric) are the oldest, foundational, and most venerable of the Liberal Arts. These three Arts form the building blocks of all learning. Grammar is, as its name indicates, the learning of the rudiments of language, as well as the learning of facts which spills forth to all subject areas. The study of Classical languages is taught at an early age and is vital to thinking clearly and systematically. Learning Classical languages serves as the doorway to another goal: engaging the great literature of the culture throughout history. Logic/Dialectic is the mechanics of thought and analysis. Students learn to think analytically and critically about any subject matter- whether through the formulation of proofs in Algebra and Geometry, or through proper paragraph construction and developing and supporting a thesis in Writing. The classical student will strive to uncover falsehood in the active pursuit of truth. The Art of Rhetoric is the culmination of the Trivium. It develops the classical student to be a persuasive speaker and writer. Students learn to communicate confidently and eloquently. This Art is applied in all academic subjects. 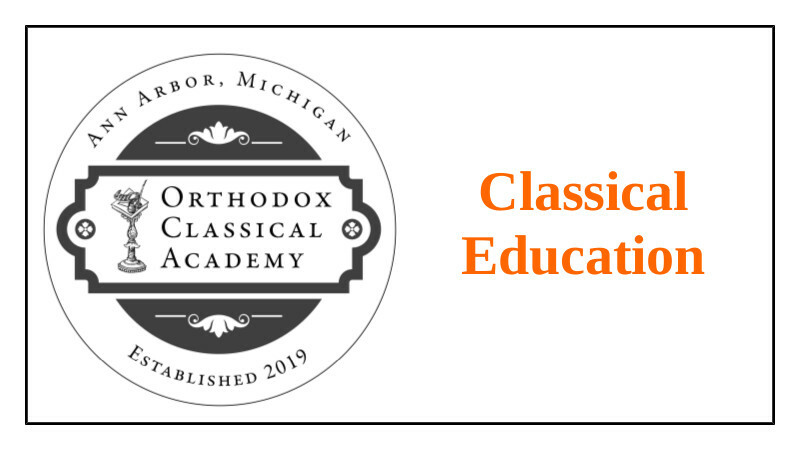 Why study Latin and Classical Greek? Latin and Classical Greek are two languages studied in Classical education. Both languages provide an outstanding educational foundation. Over 70% of all English words have roots of Latin or Greek origin. In the medical science and technology fields the figure rises to 90%. All modern Romance Languages (Spanish, French, Italian, and Romanian) are based on Latin roots. It is much easier to learn one of these modern languages when one first has a foundation of Latin. Moreover, the study of Latin and Greek demand a very high level of competence in grammar. By learning these languages at an early age, children have a grasp of grammar that is unmatched by most high school students. Acquiring such a competence with grammar stretches the mind and carries over to excelling in all subject areas. Most children even find these languages to be fun. According to the National Committee in Latin and Greek, the study of these languages has proven to help students’ performance on college entrance exams. High school students with two or more years of Latin typically score 140-160 points higher on the SAT than their peers who did not study Latin. Also, the publishers of the SAT found that students with a background in Latin had higher scores in critical reading than students who learned another language. Students with a background in Greek scored the next highest.